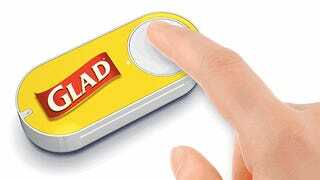 Amazon Dash Button: The Ultimate Convenience or the End of Civilization? Amazon’s latest experimental product is the Dash button, a programmable key that makes reordering essentials like laundry detergent as easy as pushing Start on the microwave. Is this the best thing that ever happened to busy America? Or a sign that we’ve become the docile servants of our Amazon Prime accounts? When the Gizmodo staff discussed this very topic today in a group chat, we couldn’t decide whether it was the best or the worst. On one side, some saw the new tech as the natural evolution of shopping. It is a magic button, they said. It is convenient and not at all troubling. Others, perhaps irrationally, believe that the button is that next sad step toward the post-consumer dystopia popularized in films like Wall-E and Idiocracy. We are losing our agency to the companies that want us to buy buy buy, some lamented. Pretty soon we’ll never leave the house or think at all. There are obviously only two ways you can feel about the Dash button. Either you are happier for its existence, or anxious about its implications. How do you feel?